Showing plenty of heart finding winning form at the metropolitan grade meeting at Sale on Wednesday, the tough galloper Nordic Duke overcame trouble in running to find the line in determined style. Dropping back from 2400m to the 2200m of the Eastcoast Handicap, the six-year-old settled back along the rails for Glen Boss who had him hooked out into the clear early in the straight. It was there that he run into trouble however, becoming unbalanced after being heavily bumped by Nesbo who would go onto fill third placing. Taking just a stride or to recover, Nordic Duke picked himself up and really attacked the line - in doing so recording the fifth success of his consistent 32 start career. A versatile galloper who has been successful over a variety of distances between 1400m and 2200m, Nordic Duke is a son of Viking Ruler and the Montjeu mare Game Duchess whose grandam is Eight Carat's Group One winning daughter Marquise. Viking Ruler is also a descendant of Eight Carat - giving Nordic Duke a 4 X 4 cross of one of the great Australasian breed shapers! Raced by Gurners Bloodstock Co, Peter Walker, Peter Reynolds, CWL Racing, M D Chapman, B L Anderson, GPJA Syndicate and & Ballymore Stables, Nordic Duke has won nearly $150,000 for his happy connections. Hopefully our winning form can continue into the week as we cheer on runners at on the Pakenham synthetic on Thursday and Friday. Simply Explosive is the first of those and Michael Moroney is more hopeful than confident about the three-year-old's prospects in the Cardinia Club Maiden Plate. "We hoping a drop back in distance will help him," he said, "but he has been a bit disappointing." Bonnie Belle, who really caught the eye charging home late after being badly held up for runs at Flemington a few weeks ago, gains a run as emergency in the fifth heat of the Rivette Series. "Providing she handles the synthetic and brings that form with her she should prove very hard to beat," Moroney enthused. 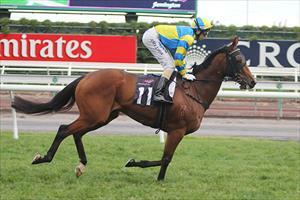 "Her last run was very, very good and we expect her to go close with Glen Boss aboard." Trendsetter is our Friday runner and he is another we have plenty of time for. "He is also a question mark on the track but he has been going very well and on his track work he can figure in the thick of things." Having his first run since late January, Trendsetter has raced well fresh and in seven starts is yet to put in a poor showing.